It’s got hearts with an arrow going through them. 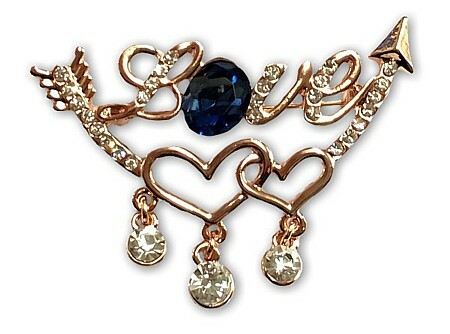 It’s got the word love, embellished with sparkling clear rhinestones and a blue oval crystal. So the person that wears this brooch is showing the world that they’re loved – a lot! An ideal little gift to give to a girlfriend or wife. And perfect for children to give to mums, aunts and grannies. Gold finish. Size:5cm x 2.5cm (2" x 1").